Double Miter Saw System with digital display of cut length, miter angles and auto feed. 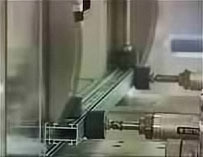 Cutting extrusions and PVC, curtain wall and other high and low volume production. Two heads with cutting angles 90, 45, 67.5 (22.5) degrees are available. 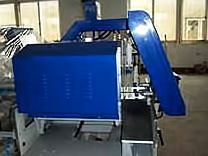 Automatic feed and cycle run. Touch screen and NC control system, with high accuracy. Digital display with high positioning accuracy. Cushioned pneumatic clamping by push button. 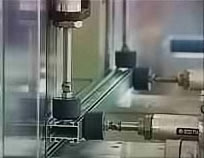 Rack and pinion drive on traveling head with digital positioning.